Happy July!! I made this quilt as a tester when I was writing my Simplify pattern, and thanks to my big kids being at “cousin camp” last week, I had some time to finish it up! The fabrics are Cotton and Steel, mostly a selection of these whimsical prints from the line Spectacle with a few prints from my stash thrown in. The background is Kona cotton in Pewter. I had a really old cut of double sided minky in the perfect color to back this with. It’s so soft and slippery it can be a pain to work with, but nothing a big can of basting spray and a few pins can’t tame. 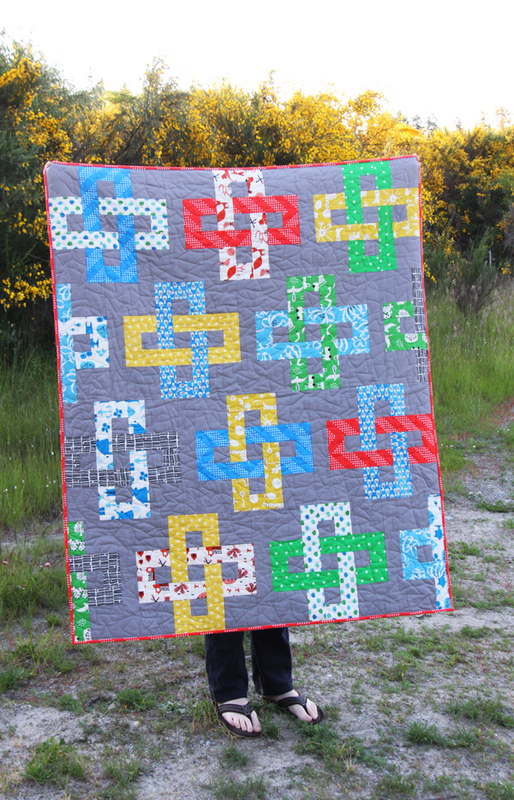 I started quilting this with random free motion…without any plan or thought to the design. A few blocks in I panicked that I had ruined the quilt (it looked like a spiky hot mess), but I pressed on, and after I was finished I actually kind of liked it. I call this design “spiky-hot-mess-no-plan-quilting”. The fluffy minky makes it look kind of cool on the back. Let’s pretend it was intentional. Because I know I’ll get asked, yes I used batting, and here is a post I did years ago about basting and quilting with this double sided minky. Sometimes I skip the batting or use a piece of flannel, but I love the weight with batting after it’s washed. 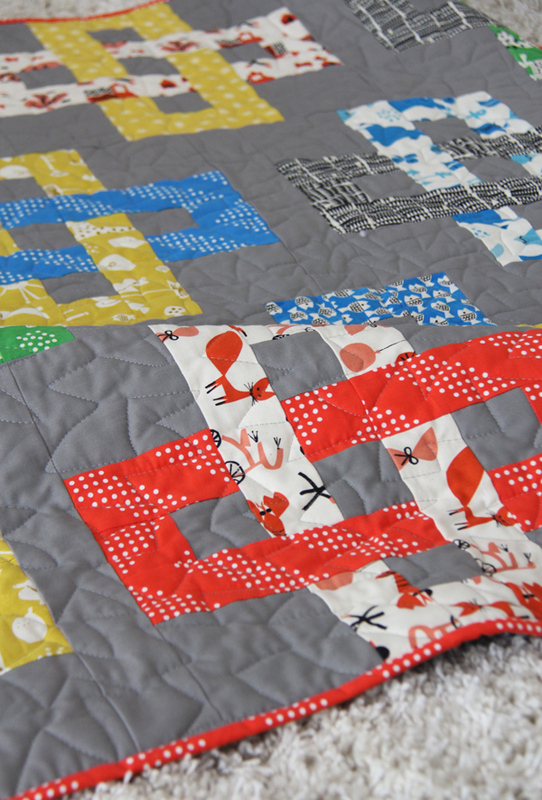 The pattern for this quilt is the crib size of Simplify…still at the top of my favorite patterns to make! 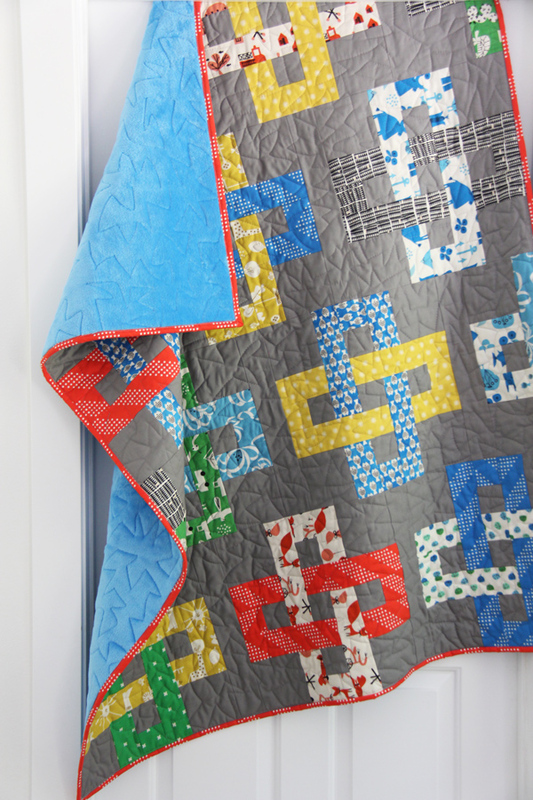 Beautiful – and awesome quilting!! You did it beautifully!! I love the brights with the gray background. Always a winner in my book. I like everything about the quilt. Did you do the quilting on a domestic machine? The binding is nice and bright too. Beautifully done! The quilting looks great! How can the name of this quilt be even better than the actual quilt itself? It is! LOL! You and me both! Thank you! Definitely give minky a shot! Just baste it a bit extra than you normally would and go slow…it’s actually not hard at all! 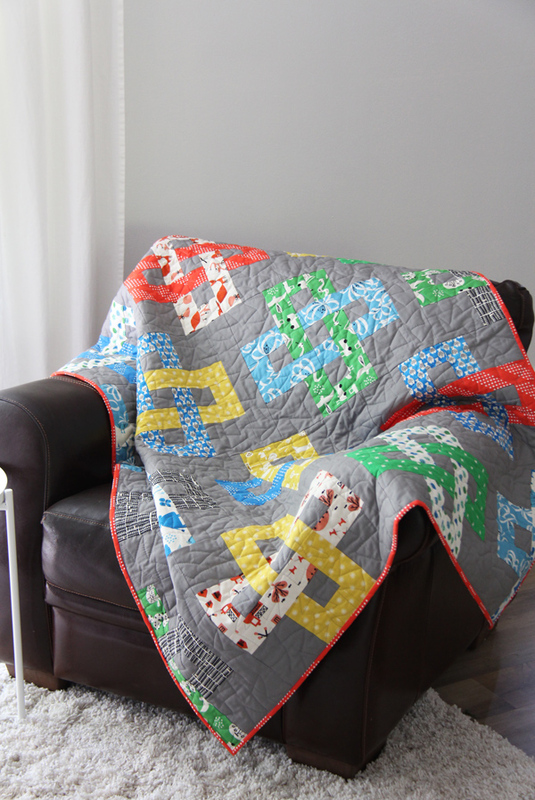 Love everything about this quilt: it is fun, colorful and the quilting is fresh and funky! Just adorable! I just finished a quilt with a minky backing and it was my first…it wasn’t double sided but I found it not too bad for slipping or shredding/pilling…so relieved! Anyway, I would definitely do it again. 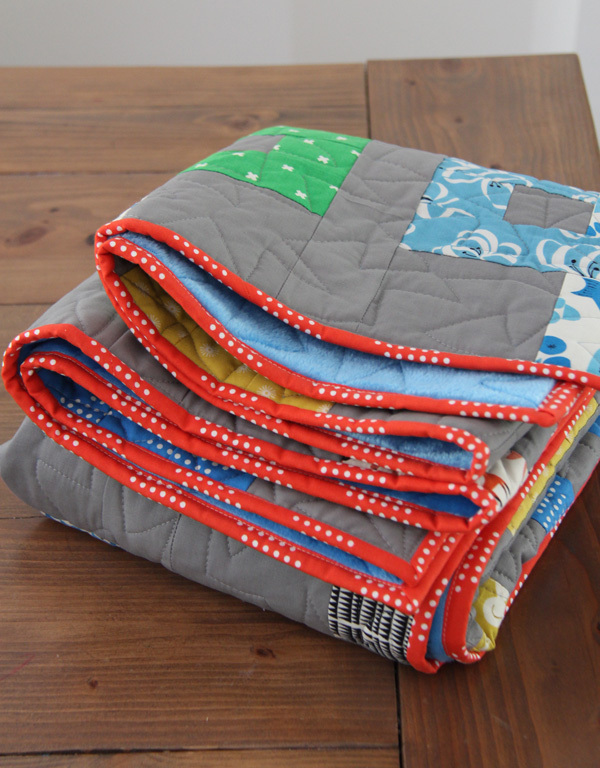 Love your quilt…so sweet! I may have to put this one on my list for one of my grandsons! I’m so glad you found minky easy-ish to work with! They are the quilts my kids use the most! It does take a bit of practice but I always love the result! Thanks for visiting! Allison, thanks for being so generous and helpful to all of us. I love your patterns and you have caused me to break my resolution not to buy more patterns–can’t help myself with your great designs. Hi Allison! Your quilts make me happy!!! I especially like Baby Sophie’s Hourglass pink quilt. So lovely. Keep on keepin’ on! You are so inspiring! Hi my name is Patricia. I have just subscribed. Thank you for your inspirational thoughts and helping me see that quilting is fun, if you let it. I have only just started just over a year ago and love it. Thank you so much, Allison, for sharing your beautiful quilts! My mom and I have been quilting together for a several years now. We just finished making quilts for all of the grandkids-6 total. 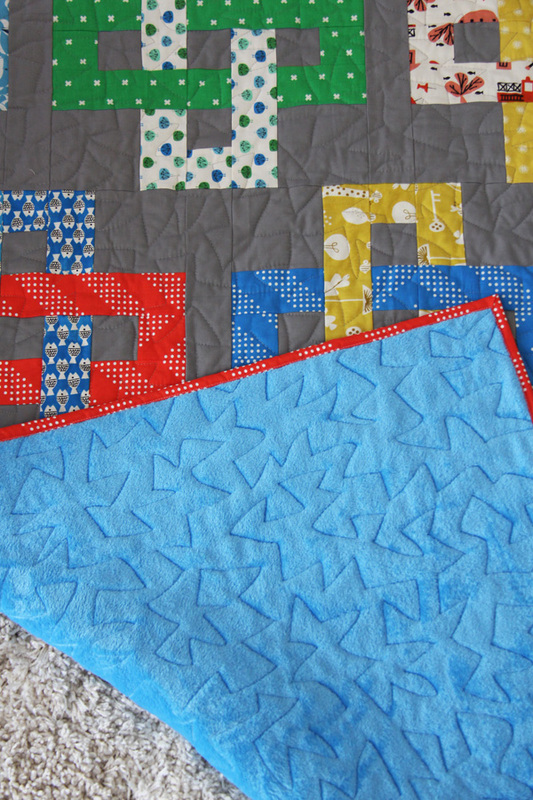 Each quilt is a different pattern, and your Simplify pattern was hands-down our favorite! It went together beautifully and looks stunning! Thanks again!! Oh wow that’s so fun! What an amazing gift for all the grandkids! Your blog is one of my favorites. I’ve had a lot of trial and error since I started quilting almost 11years ago. I’m mostly self taught through tutorials and YouTube. Finally finished my Simplify quilt. Loved every moment of the process.